The one who cannot howl, will not find one's pack. Though the gifts of wildish nature come to us at birth, society's attempt to "civilize" us into rigid roles has plundered this treasure, and muffled the deep, life-giving messages of our own souls. Without Wild Woman, we become over-domesticated, fearful, uncreative, trapped. Clarissa Pinkola Estes, Ph.D., Jungian analyst and cantadora storyteller, shows how woman's vitality can be restored through what she calls "psychic archeological digs" into the bins of the female unconscious. 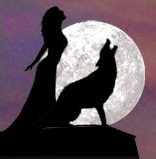 In Women Who Run with the Wolves, Dr. Estes uses multicultural myths, fairy tales, folk tales, and stories chosen from over twenty years of research that help women reconnect with the healthy, instinctual, visionary attributes of the Wild Woman archetype. In this book, Dr. Estes has created a new lexicon for describing the female psyche. Fertile and lifegiving, it is a psychology of women in the truest sense, a knowing of the soul. - Thanks to dear Branka for providing info about this beautiful book, may you who read it be touched by its inner message. Feminine Consciousness | also listen to talks (audio) by Sufi Master Llewellyn Vaughan Lee via Golden Sufi Audio Archives. it address the issue: Why do so many women experience their mind and thinking process as negative, undermining, creating doubts, judgments and anxieties? Is it because they have adopted a masculine mind which is not in harmony with their natural relational consciousness? click here to listen. Hear O Humanity! ... Reverence the womb that bore you!